The Research Society for Victorian Periodicals is pleased to announce the winners of this year’s Robert and Vineta Colby Scholarly Book Prize is The Routledge Handbook to Nineteenth-Century British Periodicals and Newspapers co-edited by Andrew King, Alexis Easley and John Morton. The Committee, chaired by Katherine Ledbetter, describes the book as “a standard reference work” that offers “cutting-edge, comprehensive scholarship by experts in each area”. 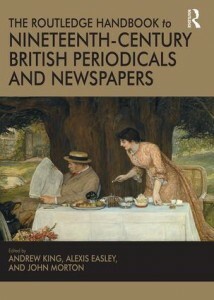 The volume was seen as “wide-ranging and diverse” in ways that stepped beyond Great Britain to consider British newspapers and periodicals in relation to North American, European, Australian and Asian publications. Congratulations to all scholars involved in the volume!